Station Hollywood: Happy birthday to superstar Vaijayantimala. Happy birthday to superstar Vaijayantimala. Happy birthday to Vaijayantimala. The viewers of bollywood films wish happy birthday to dancing queen Vaijayantimala on 13th August, 2017. She had ruled bollywood films during the 50s and 60s, during an age when muslim actresses like Nargis, Madhubala, Meena Kumari rocked silver screen. She was the first South Indian actress to create a sensation in bollywood films and paved the way for other South Indian actresses to follow like Hema Malini, Sri Devi, Jaya Prada, Meenakshi Sheshadri, and others. There was no successful actor of the 1950s and 1960s, who did not act opposite Vaijayantimala. The list is very long ranging from Dilip Kumar to Raj Kapoor, Rajender Kumar to Shammi Kapoor, Dev Anand to Pradip Kumar, Joy Mukherjee to Uttam Kumar. In 2013, she received the lifetime achievement award too for her immense contribution in Bollywood films. Her online chemistry with Tragedy King Dilip Kumar created history in bollywood. Most of their films including Devdas, Naya Daur, Madhumati, Paigham, Ganga Jumna, Leader, Sunghursh ended up being blockbusters. Besides dancing, she was sublime in the role of a tawaif in Bimal Roy’s film Devdas, in the role of village girl in Bimal Roy’s Madhumati. Vaijayantimala used to do a lot of homework also in respect of her role. When she was awarded best supporting actress award in filmfare for her performance in the film Devdas, she did not receive the award. She said after reading the literature of Sarat Chandra Chatterjee, she found that Chandramukhi, the character she played, was equally a heroine as Parvati. Probably Madhumati, released in 1958, marks the best performance of Vaijayantimala in her entire career. Her innocence reflected in her acting and she made the audience spellbound with the lips given in songs composed by Salil Choudhury including “aa ja re pardesi”, “ghari ghari mera dil dharke”, “daiya re daiya re”, etc. She received the filmfare award for the best actress for the brilliant performance in the film. On one hand she was brilliant opposite Dilip Kumar, on the other hand she created sensation with Raj Kapoor as well. Their film Nazrana did mediocre business. But Sangam, released in 1964, was probably one of the biggest hits of Raj Kapoor in his entire life. Vaijayantimala’s stylish performance opposite both Raj Kapoor and Rajender Kumar created a benchmark which could hardly be reached. Sangam still remains one of the most landmark films based on triangular love story shot at exotic locations in London, Paris, and other European countries. Shankar Jaikishan was matchless in Sangam. The acting performance of Vaijayantimala was excellent and she received the filmfare award for the best actress once again. The last scene where Vaijayatimala questioned both Raj Kapoor and Rajender Kumar about deciding about her life, had become a trend-setter. She justified the fact that she had affair with Rajender Kumar, but from the time she married Raj Kapoor, she fulfilled all the responsibilities of a hindu wife. She had been followed by numerous actresses of the following period in similar roles. 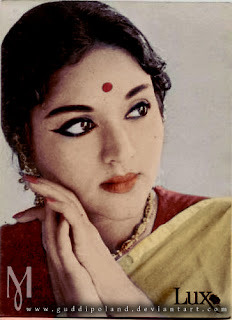 In the 60s, Vaijayantimala was matchless. Her name was enough to make any film hit. The list of her hit films include Nagin opposite Pradeep Kumar, Suraj opposite Rajender Kumar, Amrapali opposite Sunil Dutt, Prince opposite Shammi Kapoor, Choti Si Mulakat opposite Uttam Kumar, Jewel Thief opposite Dev Anand, Pyar Hi Pyar opposite Dharmender, to name a few. In fact her combination with Rajender Kumar and Shankar Jaikishan created sensation in the 60s. All their films ended up being silver jubilees including Aas Ka Panchi, Suraj, Sangam, Zindagi, etc. Her lips in landmark songs like “kaise samjhayun bai na samajh ho”, “itna hai tujhse pyar mujhe meri raazdaar”, “o mere sanam”, “titli uri” had become immortal over a period of time. Besides her standard of classical dancing in films like Katputli or Amrapali had created interest among viewers to appreciate aesthetic dance numbers which became an art in due period of time. Her films should be restored and preserved. Happy birthday to melody-queen Lata Mangeshkar. Happy birthday to legendary composer Pyarellal. Happy birth anniversary to actress Sadhna. Happy birthday to Rishi Kapoor. Happy birthday to beauty queen Saira Banu. Happy birthday to gorgious star Sri Devi. Happy birthday to genius singer Suresh Wadkar. The biggest bollywood blockbusters of 1967. Happy birth anniversary to Sadhna. Rajender Vaijayantimala films are still popular.